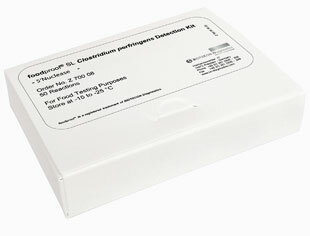 The foodproof SL Clostridium perfringens Detection Kit specifically detects the pathogenic species Clostridium perfringens in foods. Once in the intestine, food contaminated with C. perfringens is considered harmful due to the build of enterotoxins it produces. This bacterium is an anaerobic spore former, proliferating under conditions without oxygen, such as canned food or within a piece of meat. C. perfringens forms environmentally resistant spores that are not killed by boiling and other cooking processes.